You're going to LOVE rag stitching! Here are instructions to make the type of primitive rag quilts that we display on this website. I encourage you to try making your own if you enjoy sewing. Of course I am hoping that you will buy your homespun fabric or your pre-cut quilt squares here! But if not, please be sure that you use 100% cotton HOMESPUN fabric. Other cottons just do not fray as well. Before you read the instructions below, read this quick summary about rag style stitching. Then take a look at this document with instructions and pictures about how to make a rag quilt square and how to clip the edges. See the chart below for the approximate number of fabric squares you would need to make various size quilts. The FINISHED size of each square will be about 1.5 inches less than the starting size due to seam allowance and shrinkage. Please remember that this style of quilting will require more fabric than just a quilt top because this style includes the top AND the back side as well. Please feel free to link to this page. Credit to Jubilee Homespun Fabric would be appreciated. Cut your fabrics into enough squares to make whatever size quilt you desire. Finished size of each square will be about 1.5 inches less than the beginning size. Cut an equal amount of batting squares 2 inches smaller than the fabric squares. Center one batting square inside two fabric squares and secure with pins. Machine stitch, using a small tight stitch, across all three layers from corner to corner to form an X. Start and stop your stitching about 1/2" from the raw edges. Do this on all your squares. Sometimes a walking presser foot can be helpful when stitching your X but if you don't have one of these, just pin tightly and lift the presser foot from time to time as needed to keep the layers from sliding. Begin stitching the layered squares together in rows, making a 5/8 inch seam. Be sure that the batting is encased INSIDE the squares and does not extend into the seam allowance. Then stitch the rows together, matching up the seams on each row. When the squares are all pieced together, stitch around the outer edges of the quilt or throw about 5/8" from the edges. Clip all the seam allowances about 1/2 inch deep and about 1/2 inch apart, including the outside edge. Be VERY CAREFUL not to clip into the stitching! This is a good TV night project. Wash in a washing machine in cold water on gentle cycle to work the strings loose. A liquid fabric softener will help. Before drying, take it outside and shake well. Many of the strings will shake loose at that point. Stop once during the dry cycle to remove lint from the lint trap. Shake quilt again after it's dry. Some people prefer to do this washing and drying at a public laundry facility to keep all the strings out of their washer and dryer. We use a standard washer/dryer set. A few strings will continue to work loose over time, but the stitching will stabilize the seams. A rolling lint brush will help pick up any remaining loose strings. A lightweight throw or tablecloth can be made the same way, just leave out the batting and the center X stitch. This same method can be used to make just about anything! Always use homespun fabric or feedsack fabric to get the best "fray." Regular quilting cottons do not fray well. 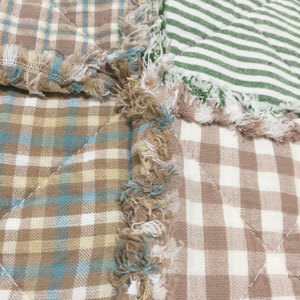 Material details for king size rag quilt made with 10" squares. Material details for queen size rag quilt made with 10" squares. The chart below shows the required number of quilt squares for various size quilts & squares. The number of fabric squares required includes enough squares for both the front and the back of your quilt. Approx Number of 5" Fabric Squares Required Approx Number of 6"
Fabric Squares Required Approx Number of 10"
Small Size 32" x 56"
The FINISHED size of each square will be about 1.5 inches less than the starting size due to seam allowance and shrinkage. Please remember that this style of quilting will require more fabric than just a quilt top because this style includes the top AND the liner. You will also be making much larger seams than in traditional quilting and thus using more total fabric yardage.